When I think of Dubai, I naturally think of opulent luxury. It’s hard not to. Home to the world’s tallest building, the world’s largest mall and one of the few places in the world where you can order an Uber Chopper, the glamorous emirate is a place for indulgence and excess. I’ve travelled to Dubai on several occasions and knew this all too well. Deciding where to stay in Dubai is quite frankly mindboggling. The competition between hotels is extremely high, which each hotel aiming to redefine the notion of luxury in their own way. There truly is something for everyone in Dubai but if you’re after sumptuous extravagance, there really is only one place to stay in Dubai, the newly opened Palazzo Versace. Palazzo Versace Dubai is the second hotel from the iconic fashion brand, the first being on Australia’s Gold Coast. Opened in December 2015, the hotel is an ode to luxury with Artistic Director Donatella Versace overseeing design for all of the interiors, including each of the 215 rooms and 169 condominiums. Design elements include hand-cut marble, stained-glass mosaics and ceilings hand painted in gold as well as the Medusa head, Greek Key and iconic Versace prints. 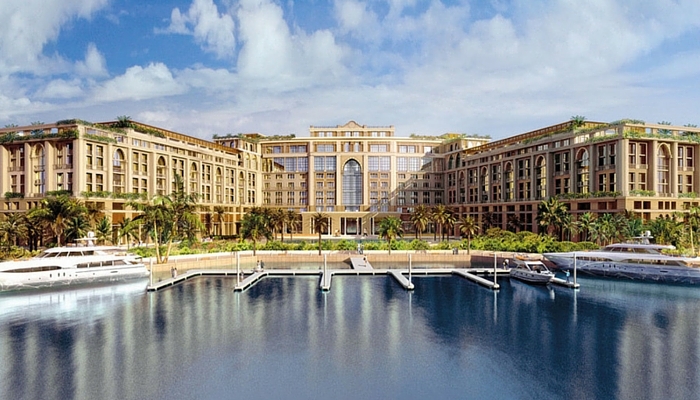 Situated on the rather quiet Dubai Creek, Palazzo Versace has an imposing presence on the waterfront. Styled after a 16th-century Italian palace, the hotel is one of the first to be opened in Dubai’s new Cultural Village and therefore enjoys a premium position in what is sure to be Dubai’s hottest spot. Currently, the Cultural Village is a work-in-process, with building work going on around Palazzo Versace. This wasn’t a problem at all for me; it’s totally unnoticeable once you’re in the hotel and its grounds, which act as a lush paradise amid the construction. One of the buildings currently being constructed in the vicinity is set to be the tallest building in the world – overtaking Dubai’s own Burj Khalifa. Once inside the hotel itself, you are transported to an oasis of Italian luxury. The floor of the 1,000sqm lobby is decorated with 1.5 million mosaic pieces while the ceiling is adorned with the most spectacular chandelier. It’s a truly breath-taking space and sets the tone for the rest of the hotel. While furniture features Versace prints, the textiles are decorated with peacocks, falcons or horses. I stayed in one of the sumptuous deluxe rooms with views of the lagoon and Dubai Creek. The room was truly magnificent. The high ceiling and floor-to-ceiling windows gave the room a super spacious feel while the details just oozed luxury. Beautiful timber parquet flooring was paired with the most luscious rug in the room and dressing area while the bathroom mirrored the lobby with marble and mosaic elements. My room had a soothing salmon pink colour theme with Versace-printed linens and textiles. The bathroom, complete with a walk-in shower, his and hers sinks and a huge bath, was as luxurious as you would expect from the House of Versace. The service more than matches the opulence of the hotel; each member of staff was so friendly, accommodating and welcoming – the staff at the pool always made sure I had a shady cabana to read in and kept me cool with cold towels while the doorman, Victor, gave me a warm welcome every single time. Staying at Palazzo Versace was truly an experience. The entire hotel is a sublime design spectacular, which the photos are able to capture more than words could. My entire stay here was wonderful. I’ve stayed at a lot of incredible hotels during my travels but my stay here was a very, very special experience. Hotels in Dubai better watch and learn, Palazzo Versace has really raised the bar and redefined the meaning of 5* luxury.